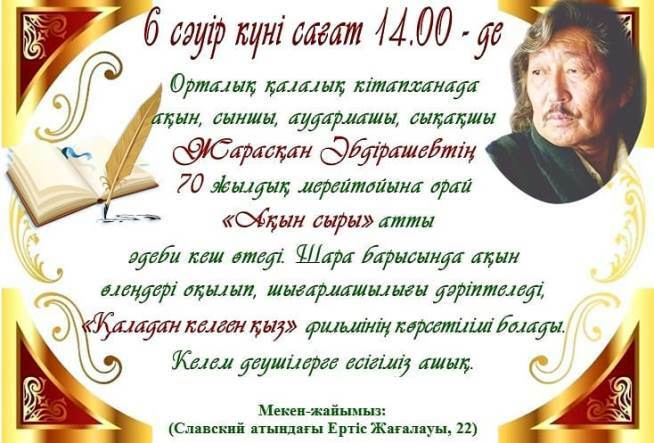 On the 6th of April in the Central city library (22, Irtysh Embankment named after Slavsky) literary party «Akyn syry», devoted to the 70th anniversary of the poet, critic and translator Zharaskan Abdirashev, will be held. Zharaskan Abdirashev was born in 1948 in Aralskiy area, Kyzyl Orda region. All his creative life he wrote poems about people, it’s troubles, about love to his native steppes, keeping pure sources of the Kazakh language. Zharaskan Abdirashev published more than 20 books. One of them - book of poems – «Letniye grozy» was translated into Russian by Rimma Kazakova. Thanks to Zharaskan Abdirashev the works of Pushkin, Paul Eluard, A. Blok, Palestinian poet Muin Beis were translated into Kazakh. Incredible inheritance is left for children: translations into Kazakh of Agniya Barto, Korney Chukovsky and other poets’ compositions. During the event you will hear his poems, watch the film «Devushka iz goroda» screened after his works. Everyone is welcome to come!